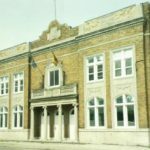 Introduction: A Breif History of Wyandotte: The area that became the City of Wyandotte was first settled in 1732 by a branch of the Huron Tribe known as the Wyandots. The Wyandots first arrived from Ontario, Canada, when their French allies founded Detroit. The Wyandots followed the Detroit River ten miles to the south and founded a village named Maquaqua. The first permanent non-native settler in the area was Major John Biddle. He was an officer in U.S. Army during the War of 1812 and a mayor of the City of Detroit. His land was located in the area of Biddle Avenue and Vinewood Avenue. He named his farm “The Wyandotte” after his neighbors to the south. When other settlers came to the area they started to refer to the area as Wyandotte. It is from Biddle’s farm that the City of Wyandotte derives its name. December 12, 1854, marks the date of the founding of the Village of Wyandotte, which coincides with the founding of Wyandotte’s first industry, the Eureka Iron Works. 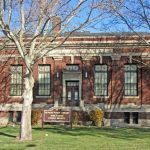 The Village of Wyandotte officially became the City of Wyandotte on April 8, 1867. In 1871, the Wyandotte Shipyards began operation. 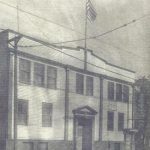 Polish Americans in Wyandotte: Preceding the Poles to Wyandotte were the Irish and German. The shipyard and chemical industries of Wyandotte drew the immigrants, as well as the dream of freedom and a better life. It was in 1866 that the first Polish immigrants arrived in Wyandotte. 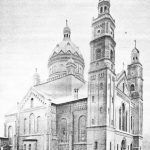 They formed the first Parish Society in 1870, that of St. Stanislaus Kostka. Our Lady of Mt. 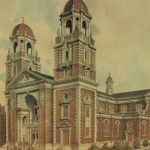 Carmel Roman Catholic Church: In September 1899, Bishop Foley approved the purchase of land for the construction of Our Lady of Mount Carmel Roman Catholic Church in the area of Tenth Street in Wyandotte, which at the time was farm land and undeveloped fields. The cornerstone for the first church building was laid on December 3, 1899. The structure was dedicated in 1900 and was used until 1915, when the present church building was built. Services were conducted in Polish. 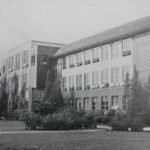 In 1968, after the new school was constructed, the old church building was demolished. The pastor at the time of the construction of the current church building was Rev. A. Grudzinski. It was designed by Harry J. Rill, a Detroit architect. The style is Italian Renaissance with the shape of a cross for the floor plan. 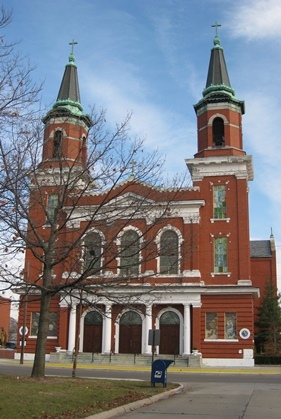 The church was built with extensive marble, rich ornamental plaster, painted gold leaf panels on either side of the high altar, original stained glass windows dating to 1915 designed and built by the Munich Stain Glass Company in Chicago, extensive stenciling around the windows, ceilings, and beams throughout the church, and towering twin spires. As of 2013, Our Lady of Mt. Carmel officially became Our Lady of the Scapular Parish when St. Stanislaus Kostka Catholic Church in Wyandotte merged with Our Lady of Mt. Carmel. Our Lady of the Scapular is a Polish parish that serves the spiritual communities of Our Lady of Mt. Carmel and St. Stanislaus Kostka. Woodrow Wilson Post 2 P.L.A.V. 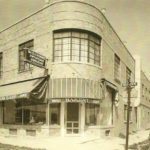 Become a member of The West Side Detroit Polish American Historical Society. WSDPAHS is a 501(c)(3) non-profit, tax-exempt, interdisciplinary organization. To make a donation supporting our projects and activities, please contact us.